Editor’s note: Tony Dwyer, U.S. portfolio strategist for Canaccord Genuity, and his colleagues author a widely respected monthly overview of market conditions, technical factors, and future market outlook called the “Strategy Picture Book.” The following provides an excerpt from their Jan. 7, 2019, report on the macro market outlook. Last year began with a global synchronized recovery, historically low volatility, extreme bullishness, a ramping economy, and the potential for S&P 500 (SPX) operating EPS growth of 20% or more. We begin 2019 with a synchronized global slowdown, high volatility, extreme bearishness, a sharply slowing economy, and the potential for flat SPX earnings growth. We believe this fourth market crash over the last 40 years (1987, 1998, 2011, and 2018) more than discounts the slowing domestic and global economy, as long as the Fed stops making policy and communication mistakes, the Trump administration resolves the trade conflict with China, and the yield curve remains positive. The comments from Fed Chair Powell at the American Economic Association and recent comments from the Trump administration helped relieve the fear around these issues. The equity market decline since the September peak still looks like a policy-driven market event rather than a credit-driven economic crisis. Indeed, the data suggest the 20% drop from the peak represents the fourth nonrecession crash since 1950. The other three “crash” occurrences (1987, 1998, and 2011) had very consistent post-crash behavior. 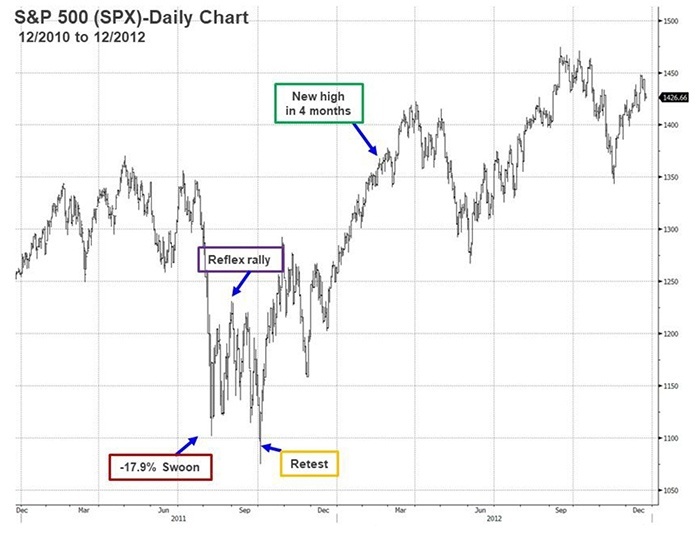 Once the market saw a climactic low, there was a sharp reflex rally in all three cases, followed by a retest of the low within four to five weeks, and then new highs. Currently (as of Jan. 7, 2019), the SPX is up 8.1% from the intraday low on Dec. 26, 2018, suggesting the reflex rally has largely run its course, and that a retest of the low should take place toward the end of the month. The crash saw a sharp reflex rally, then a retest 22 days later (that broke low by 1.8%), followed by a move to new highs. Our rally requirement indicators suggest buying as the retest develops. Over the past two months, we have identified two 10-week rate-of-change (ROC) indicators that signaled a time to take a more offensive position following corrections over the past 10 years, even with the prospect of a retest. Last week’s close (Jan. 4) in the SPX and CBOE Volatility Index suggested an intermediate-term shift in momentum using this indicator. The inflation outlook remains subdued. We believe Fed Chair Powell’s more dovish stance signaled at the American Economic Association acknowledged the communication mistake in the December FOMC meeting press conference and was likely a result of clear signaling in the financial markets coupled with collapsing five-year inflation breakevens and commodity prices. The U.S. Treasury 2-10-year yield curve remains positive. The tightening financial conditions over the course of the past month were more likely a result of poor communication from the Fed and the resulting financial market weakness, which Powell has since walked back. EPS should slow but remain positive, along with economic activity. Although there are clear signs in the ISM new orders, global economic data, and commodity prices to suggest a sharp slowing in growth in the first half of 2019, we see no reason to change our expectations for 5% SPX operating EPS growth in 2019. We had already anticipated an economic and earnings slowdown in 2019 following the rolling off of the 2018 tax cuts and the impact of tighter monetary policy. We believe the fear of recession is likely overblown absent more extreme policy errors; therefore, we expect a retest of the highs in 2019. The market collapse in the fourth quarter of 2018 points to a historic market event at first created by excessive optimism and historically low volatility, which was then followed by policy and communication mistakes from both the Fed and White House. The dramatic weakness has created the perception of a more serious economic swoon, which our fundamental core thesis continues to suggest is unlikely to materialize unless the Fed makes a more serious policy mistake that results in a credit crisis through an inversion of the yield curve, and the Trump administration is unable to resolve the trade issues with China. The consistency of the data surrounding nonrecession market crashes, our rally requirement indicators, and excessive pessimism suggests investors should expect a bit more reflex rally, followed by a retest of the low, and then a move toward the 2018 high. We are basing our new 12- to 18-month SPX target of 2,950 (down from 3,200) on these factors, which would suggest a valuation of 17.5X our 2019 SPX operating EPS estimate of $168.